When Alexander had given way to fears of supernatural influence, his mind grew so disturbed and so easily alarmed that, if the least unusual or extraordinary thing happened, he thought it a prodigy or presage, and his court was thronged with diviners and priests whose business it was to sacrifice and purify. . .
Part V is longest and final section of Dakin’s biography of Mrs. Eddy, and Dakin’s choice of Plutarch quote has a heavy air of foreboding doom. Ms. Eddy’s health and mental state have been continually brought into question through out the book, and they continue to come into play in The Twilight of a God. Dakin seems to be slightly in awe of Ms. Eddy throughout the The Twilight of a God. Ms. Eddy continues to have a steady stream of constantly changing students/attendants and has done her best to keep the Board of Directors in the dark about her declining health. By this point, there have been several published accounts speculating her demise, all of which have been met with her firm written rebuttal. To counter Augusta Stetson’s amazing church in New York, Ms. Eddy has the Board of Directors build her a grand Mother Church in Boston. The amazing “demonstration” of the Mother Church’s makes world-wide headlines, and Ms. Eddy’s absence at the opening is noticed. 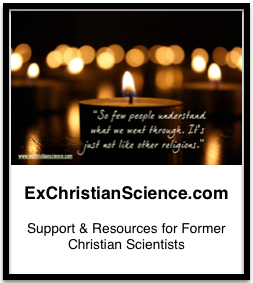 To help manage her publicity issues, Ms. Eddy creates the Committee on Publications, to make sure the “correct” views on Christian Science –and her well being– are published. Ms. Eddy’s attempts at PR-control fail and the World runs an unflattering piece calling her “enfeebled” (p. 401). Dakin disagrees with this assessment, in his view, Ms. Eddy may be in poor health, but she is not being used as a puppet for the Board of Directors, or any one else. The World’s piece concerns Ms. Eddy’s son, George Glover and soon Ms. Eddy finds herself embroiled in what has been termed the Next Friends lawsuit (1). The looming question, is Ms. Eddy mentally fit to manage her affairs? The suit is never resolved, and is withdrawn. Ms. Eddy’s response to all this is to direct the Board of Directors to found the Christian Science Monitor so that she may control the news as she sees fit. During this time, Ms. Eddy moves from Pleasant View to Chestnut Hill (outside of Boston), because the M.A.M. there has gotten to be too much to handle. M.A.M. continues to follow and plague Ms. Eddy with Agusta Stetson’s power and influence coming to the forefront. Dakin gives several pages of unique (and paranoid) reasoning by Ms. Eddy’s, and eventually Ms. Stetson is excommunicated by the Board of Directors. At this stage I would love to read something from the Board of Director’s perspective on this entire affair. Ms. Eddy has carefully set up her church with bylaws making it impossible for anyone but herself to change anything. Aside from a few bequests, the bulk of her property is to go to the Church when she passes, and Ms. Eddy is the Church. I agree with Dakin, the Board of Directors must be quite distressed from 1901 when the first rumors of her death began, until she finally passed from “natural causes, probably pneumonia” on December 3, 1910. When Ms. Eddy died there was no “leader” to take over, just the Board, and the Manual of the Mother Church which Ms. Eddy had arbitrarily added to as fear and M.A.M. inspired her, as many of her by-laws were aimed at preventing Ms. Stetson from gaining more influence and challenging Ms. Eddy’s position, a proposition Dakin finds extremely unlikely. In my estimation, many of the Manual by-laws of the Church has turned out to be a real problem. First of all, there are so many interpretations of them. Second of all, they seem unnecessary. Individuals my need some guidance, but really, aren’t the Commandments and Beatitudes enough? By the way, for twenty-six million dollars, Augusta Stetson’s C. S. church was recently sold to become condos. Do you happen to know who benefited from the sale? Now that you have reviewed the book, may we have a summary and personal comments? Have you read Milmine, yet? Yes, I have read Milmine, but it was ages ago — when I was still deeply in CS, I haven’t read it since leaving, but it is in my to-read-again stack. I’ve also got God’s Perfect Child in my to-read-again pile as well, and Linda Kramer’s The Religion that Kills in my Amazon cart.